Spectacular Walkie Talkies shaped like Iron Man. Flexible antenna and belt clip included. Suitable for ages 3+. 2 x 9v batteries required , not included…. This toy costs approximately £9.99 (for the latest and best prices make sure you check our retailer list for the Iron Man 3 Walkie Talkies above). 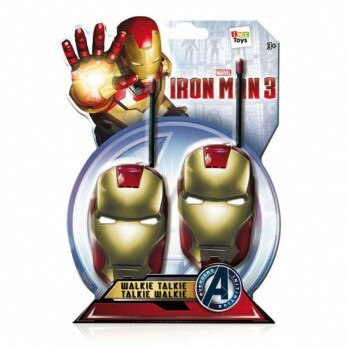 In our review of Iron Man 3 Walkie Talkies we classed it as being suitable for ages 3 years, 4 years, 5 years but recommend you check the manufacturer specific advice before purchasing.